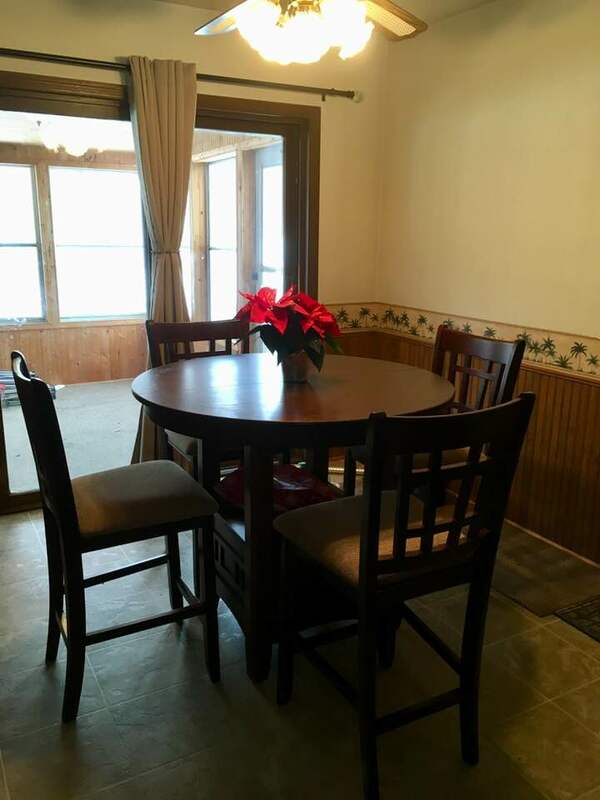 At the beginning of November, my daughter and I began the quest to find a table for our kitchen. I ended up standing guard by it until she returned. As it was being loaded up into a truck, she had tears in her eyes. After moving back to my house, we ‘temporarily’ filled in the space by putting up a long white plastic work bench. It served its purpose for longer than it should have, and six years later, we couldn’t stand it anymore. It was a good place to lay a purse, work on a project or throw junk mail, but without enough chairs, it certainly was not a table to have a meal or gather around regularly. It had really become an eyesore. Off we went one Saturday to find the replacement. I learned quite quickly how to spot the hovering sales people. I would see a clipboard and suddenly my pace would go into turbo speed, and I would weave in a pattern much similar to what I have heard survivalists teach if you don’t want to get shot. If you move fast enough, and change direction repeatedly, you have a better chance of not getting hit. I did find myself trapped on one occasion. I think I got so wrapped up in looking that I didn’t see him coming out of my peripheral vision. I gave the customary response, “No, we are just looking today.” Smile. I really don’t mind having help when I need it, and I know he needs to make a living, but sometimes I feel like I cannot have a moment just to contemplate and think as we were shopping. I assured him that I would as she and I continued to browse. Less than five minutes later, he was back by my side. This is when I really had to paste on a happy face because I don’t like to be pressured. “No, we are still looking,” I said less enthusiastically. I expected a gong to sound as if I was on an episode from the old 70’s show Kung Fu. “Yes, yes it does,” I said trying not to laugh because he was being serious. “We are done looking. The table needs to come to us. God is going to have to send it to us.” She agreed as she was not enjoying the search any more than I was. On the Saturday night after Thanksgiving, I came home and put on my comfy new pajamas, got something to drink and plopped on the couch ready to relax. The big meal was over, I had gotten some baking done over the weekend, and I was ready to be quiet. I started watching a show I had recorded while my daughter was sitting in a chair working on her computer. I suddenly woke up with a jolt to my own loud snore! Very unladylike, but the fatigue was real. “Darn! I have missed part of my show,” I said. Just as I was reaching for the remote to rewind, a furniture commercial came on. I saw a table and set of four chairs. “No,” she said. I rewound the commercial which was quite short so we could see it again. Had I not woken up, we would have missed it. We both went online and saw that they were having a sale that ended the next day, so we agreed that it would be worth the trip. Interestingly, no salesperson greeted us at the door. We zipped over to what we both knew we would like and took a few moments to admire it and picture how it would look in the kitchen. I had to track down a lady for help. Less than 24 hours later, a table and four chairs had been purchased and ready for delivery. I realized that while I was not paying attention, literally snoring on the couch, the table and chairs had indeed found us. Instead of sweating it out searching, I had just thrown up a request before heaven, and my prayer was answered. He didn’t know it had found me. How much more could be accomplished on our behalf if we would just ask, rest and trust? 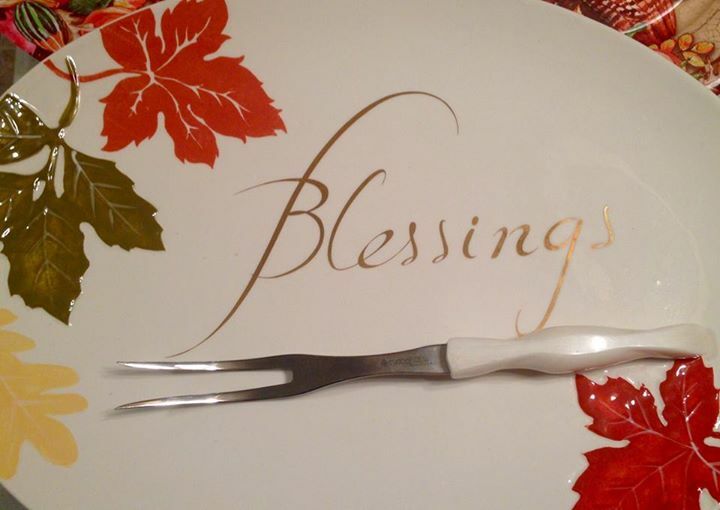 Our loving Creator tells us to freely come to the table. He pulled into my grandparent’s driveway and sighed in relief. He had packed up the three kids and made the 500 mile drive much more cautiously this time. He had checked his speed, looked to make sure there were no cars following too close and fastened up his seat belt. The cause of his anxiety was that the night before he had a nightmare from which he had awakened in a shivering sweat. The content was that he had died. He could not recall how his demise had come but only that he had not survived. With that image still in mind, he was determined to play it safe in the car without mentioning it to anyone. He thought it was either a warning to watch his driving, or it was just an overactive imagination. Either way, he wasn’t taking his chances. 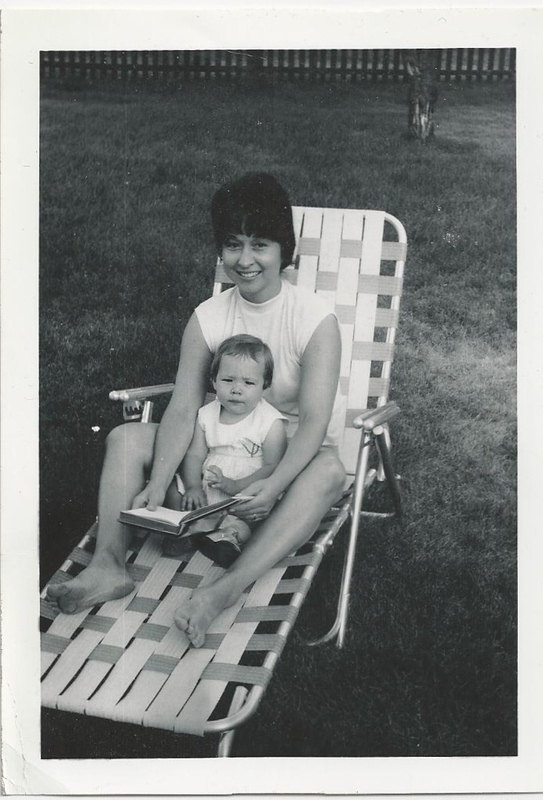 My mom, who was pregnant with me at the time, could not accompany him on the trip to see her parents. The doctor had put her on bed rest as she was in her late thirties expecting her sixth child. My two brothers stayed behind to make sure she was attended to while my dad took my two sisters and my brother along with him. Once he had parked the car he thought he was in the clear, and the dream from the night before was forgotten. On the Fourth of July, my dad, my grandpa and the three kids went out to my grandparents lake home. My dad spent what little spare time he had building model airplanes on the weekends, and he had brought one along to fly in the open fields. He positioned himself purposely away from any power lines and began flight. The plane began to have some sort of engine trouble. Once he remedied the problem, he set about to give it another try. Without realizing it, he had placed himself into the path of danger. Off the aircraft went again and suddenly looped itself around one of the voltage lines. In a flash, he was knocked off his feet to the ground by 69,000 volts. Because wireless technology didn’t exist back then, the wire connecting the hand held remote to the airplane was the conduit for power to surge through his body from the overhead lines. Even though the power had been knocked out, he was still surrounded by a highly dangerous field of electricity. No bystanders could go near him or suffer the same fate he had. Clinically, he was considered dead. Because he had fallen backwards, the remote happened to land upon his chest right by his heart. Within minutes, another 69,000 jolt was sent his way as a circuit breaker was activated to restore the power line that had been interrupted. This time, the thin wire burned away, but the second surge of power had restarted his heart much like a modern day defibrillator. 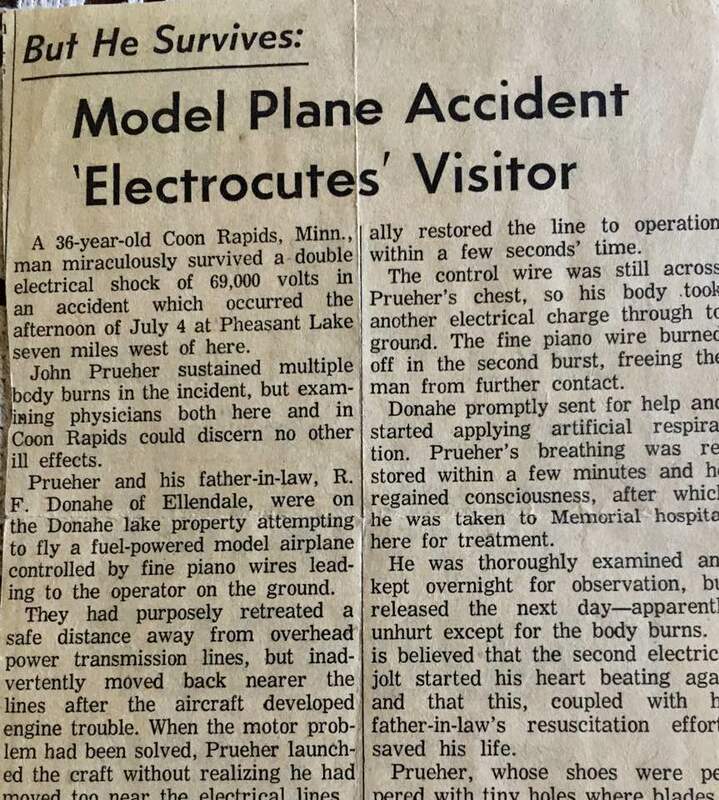 My grandpa, who had been standing by not being able to administer CPR while my dad was still connected to the source of electricity, was able to check his pulse and begin artificial breathing. My sister, who was 12 at the time, was ordered to go get help while all of this was going on. She has said that this was the day she decided to become a nurse because she never wanted to be in an emergency situation again and feel helpless. At the time of this writing, she is still a very knowledgeable and compassionate RN. Miraculously, he began to breathe on his own but was transported to the town hospital for inspection. He had multiple burns on his body with tiny grass blade holes in his shoes. Without any further complications, he walked back to my grandma’s house the next day looking no worse for the wear. One of the things that he kept seeing in his mind, however, was the imprint of his body scorched into the grass at the cabin. Apparently, it took many years for the outline to disappear. A reminder that he almost left the earth that day. When he returned home, he had some tough days where he questioned why he had lived, and many times suffered through bouts of depression. He never said he saw a light or had the usual near death experience. How different my life would have been if he had not survived. I would have been born without a dad into a family of five kids. 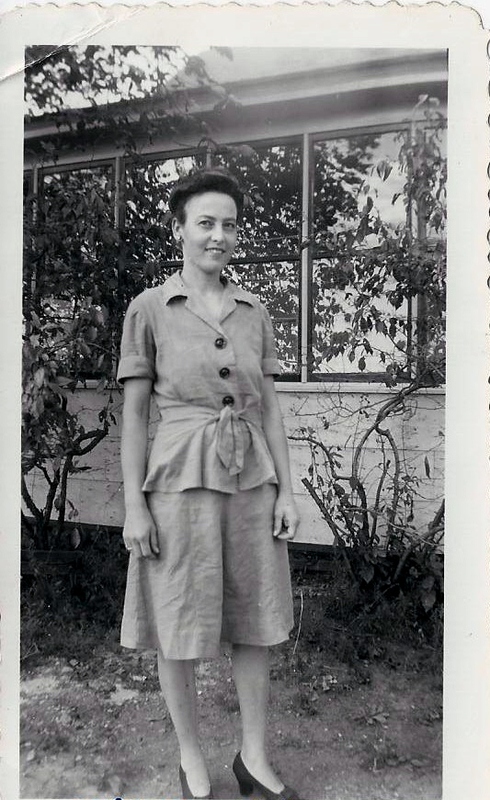 What would my mother’s life been like? It would have impacted us all in a way that we never had to experience. Instead, he lived on to hit his 85th birthday this past March and continues forging ahead to the next milestone. His survival tells me that life can change very quickly when we least expect it. And, I am called to live it to the fullest every day. I am not to live in fear of my life being cut short or a trauma coming upon me. I am here for a purpose. We all are. It’s more than just paying bills, worrying about how we can or cannot afford a material thing or if our kids are going to turn out okay. With God on our side, we can do all things with strength. If He can raise a man from the dead, how much more can He do for you? God doesn’t want me to come back to Him accomplishing nothing. Kind of like that firecracker you light and nothing happens. The dud. The dreaded dud that no one likes. You have these high expectations for some sort of sizzle and pop, so you run away expecting something great and nothing happens. That is not our destiny. We are meant to be here so others take notice, come to us for that ‘power surge’ that only comes from Our Creator that gives unlimited peace and joy no matter what. I want my life to be a shining bright light for those who feel like they are alone. For the one who needs his or her head lifted and tears wiped away with laughter. I don’t know about you, but I am not satisfied with just a little fizzle. I am going out with a bang! My daughter and I were out shopping the other day, and while she went into a dressing room, I stayed nearby looking at various clothing items. “Get over here, right now!” she shrieked. I stopped my hand mid-way on the hanger because the tone of the voice was jolting. I looked up and saw a woman towering over a boy who was no more than three years old. “I have other things to do. You are slowing me down! Get over here!” she yelled. I try not to judge a situation because I am not living her life, but if someone spoke to me the way she was to him, I would have done exactly what he did. Run the other way. She spun her cart toward a customer service counter while he fled in the opposite direction. I tried to see where he was going but he disappeared. She talked to the store representative as if there was no urgency to find her child. I moved myself farther out to try and get a better look to see where he had gone while she was taking her time focusing on what she thought was so important. Because I know we live in a society where children are not safe to be left unattended, I felt that I needed to try and find him just to be sure he was okay. I glanced around not trying to draw attention to myself because I didn’t want someone to think I was a predator instead of a protector. After awhile, I heard the wheels on her cart moving, so I knew she was on the hunt for him now that she had taken care of her own needs first. I observed her run up and down aisles searching for him. By this time, my daughter had come out, and I explained what I was watching. She didn’t call his name but merely walked briskly around the store glancing back and forth. I began to wonder if she really wanted to reconnect with him. Inwardly, I was feeling somewhat panicked as it was taking so long for her to relocate him. I was hoping he had not gone out into the parking lot on his own. Somehow she managed to put him into the child seat while her tongue lashing continued. They weren’t shouted or screamingly said in a tantrum. It was just a matter of fact statement of not feeling cared about. I turned to look back to see her not paying attention to him with her eyes glued to her phone. No interaction. No correction. No place for apologies. Just silence. We ventured across the street to another store and within moments, I was in the middle of witnessing another mother and son moment. This time, the boy was close to twelve and was carrying two boxes of shoes. Normally, I don’t go about listening to other people’s conversations with their children, but when a woman’s voice is so loud that it invades my hearing space, what am I to do? She began chastising him for every small infraction she thought he was doing. I saw him move away from her to give himself some distance. She was twice his size in weight and her face was one big scowl. Like a brute, she ran over and snatched one out of his hand. He put his head down and placed the other box under his arm. I could see that he felt he could do nothing right to please her. My daughter and I glanced over the rack at each other feeling another round of despair for this young boy. As I continued in the store, I began to contemplate what I had observed. Why had such venom been directed at these children? I understand we live in a world where some kids are diagnosed with various physical and mental disorders that can frazzle an adult’s patience, but in both cases, it appeared to me as if the moms were the ones suffering from a malady. Why is this happening? Why are these moms so angry? The first thing that popped into my mind was that both of these women had some sort of unresolved anger toward a male figure in their lives and the stress of circumstances was bringing it out toward their boys. I have to say, I would not have come up with that on my own. It made me see the situation differently. In fact, after watching the second lady verbally trash her son, I was so filled with hatred toward her that I would have loved to put her properly in her place. So to have the thought come that she herself was wounded, made me reconsider my anger. It made me view the situation through another set of eyes that were more compassionate than my own. Moving along through the store brought me to yet another mother and son. “Mom. I am tired,” he said while she was looking through bras and underwear. She spoke softly and he responded in the same manner. What was I seeing here? Respect from both parties toward one another. Her acknowledgement of his feelings and his trust in her that what she just said back to him would come to pass. I was relieved to have encountered that after the other two experiences. To some, this wouldn’t matter, but to me it does because what you see going on in public is just a small reflection of what is going on at home and eventually we all have to deal with it. I know that everyone has a bad day, both children and parents, and parenting is not easy. I guess what I was struck most by was the tone and the volume that the other two had used so that the entire store was made aware of the conflict. Like the pressure was so volatile and huge inside of them that they were bursting because they couldn’t contain it. Unfortunately, their children were the recipients of it and some of us bystanders were splashed by it as well. With all of the technology, parenting classes, scads of books and articles available you would think our society would be the best at child rearing and healthy adult living. Yet, you can see many times over we are not at the top of our game. Something is missing. If you are observant, you can see that there are gaping holes in the hearts of people. 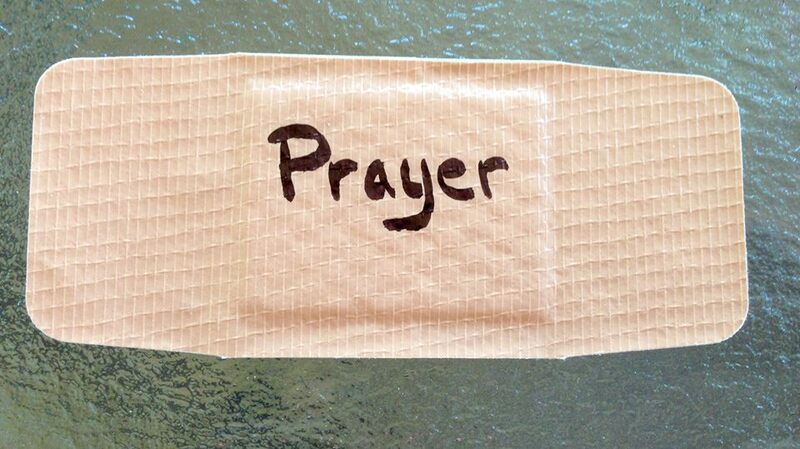 A gigantic band aid cannot fix the problem, but we can pray for America’s parents to turn toward and move into the arms of a loving Creator who can repair the damage. In turn, their children will reap the benefit of wholeness. God is faithful to restore and make well the lives of the walking wounded. We met when she was thirty-six. I didn’t know it, but she had five children in her care. By the time we became acquainted, the first four kids were thirteen, twelve, eleven and ten while the fifth one was headed for the age of seven. Unaware of the fact that she cooked, cleaned, washed laundry, cared for the sick when a pandemic swept through the house, made school lunches, and stitched up holes in clothes, I was just another one to round it all out by being the sixth. She thought her pregnancy years were behind her, but I showed up to let her know she was wrong. According to one of my sisters, after she got home from the doctor and she had learned of her state of affairs, she wasn’t quite herself. She removed her coat, stood and stared out the picture window overlooking the street and absent mindlessly began to remove her blouse button by button. Her idea was to change into more casual clothes but she forgot she was not in the privacy of her bedroom. She was stopped before she got too far and brought back to her senses. She laughed at herself, but it was quite apparent that she was in some form of shock. It must have been rough to be up at night with a newborn only to have the alarm sound at five a.m. to get breakfast ready so that everyone could be out the door on time for school. Once the house was quiet, much of her time was spent cleaning and making beds. Before she knew it, they were all back home. As the years went by, life didn’t get any less difficult as everyone had after school sports, activities and jobs. Supper became like a restaurant shift where some had to eat early and others had to eat late. When I was four, she was in the height of carting people from various destinations before everyone had their license to drive or owned their own car. The one thing she never wavered on was her appearance. No matter the stress, she always wanted to be out in public looking her best with hair combed and clothes neat. She didn’t want the world to see a disheveled woman who looked like she didn’t have it all together. I always went along in the station wagon while she drove around town. While she was dropping one off, she usually was picking up another. I tried to stick close to her side as she always seemed in a rush during this process, and I didn’t want to get left behind in the chaos. “Chrissy, we have to go,” she said as she walked through the living room. This meant I was to put away my toys and prepare to leave. Because of our hectic life, she generally spoke in short sentences to get her point across without explanation. I followed her into her bedroom as usual while she went to her dresser. She looked at her reflection in the mirror and began fixing her hair with her hands quickly. I could tell by her movements she was in a hurry. She grabbed a can and sprayed in circles all around her head to be sure all strands would stay in place. This was the era of big hair and complicated styles requiring many applications of high powered aerosol. She gave herself one quick look and then turned to see me standing waiting for her. “What smells like lemons?” she asked me. I didn’t understand, and I didn’t answer. She sniffed the air to try and detect where the odor was coming from. I saw her eyebrows come together. “Oh, no!” she exclaimed. “I can’t believe it!” Her mouth was wide open. She spun around and glanced at the product she had just used. We raced out the door with my mother smelling like an end table. When a woman becomes a mom, there is an invisible document that is signed within the sight of God where an oath is taken to let bits and pieces of oneself go while caring for the family. It stretches us to our limits at times but in that process we begin to see how wide and deep our love can go. There are moments of such great frustration followed immediately by dandelion bouquets and sloppy hugs in which all is forgiven. Our world is so fast paced you might not always recognize those who are working in the trenches, and often times, it is subtle. But, the next time you see a mom out in the store patiently dealing with a screaming toddler, stop for a minute and realize how blessed you are that you have just come into contact with someone who has taken a mother’s pledge. “I need you to pray that grandma’s surgery goes well.” I heard the plea in her voice and considered how difficult it must have been for my mom to ask for prayer. She had always been close to my grandma, her mother. “When is the procedure?” I asked. My grandma had been residing in an assisted living facility because her memory had begun to slip making it impossible for her to live unsupervised. Her physical health was superior, and the only medication she was taking was eye drops. One day, while walking down a hallway, she tumbled, broke her hip and was now in need of surgery. “I will pray, ” I said as we hung up. Then, it was as if someone pushed a fast forward button on my memory and a recent conversation with her came to my mind. At this, tears began to fall from my eyes because I was beginning to get the picture. I hadn’t gotten down on my knees to plead with heaven to spare her. I didn’t pull out scriptures from the Bible requesting that it be done. I simply had paused for a moment, took a breath and decided to let whatever I felt come to me. I wasn’t so sure I was comfortable with what I was feeling, so I decided to call my brother. When he answered the phone I explained my dilemma. “I know, ” he replied. “I feel the same way. She doesn’t want to be here anymore.” We spoke of her age and the full life she had lived. The two of us had known her as a loving grandma without being fully aware of the hardships she had endured. I hadn’t realized until I was an adult that she had suffered through an unloving, unfaithful marriage. If that was difficult enough, she had raised a bedridden daughter and later watched her die. We just knew her as the one who made the best peanut butter cookies and cherry kool aid. “I know,” he said again. With that, I felt reassured that I wasn’t the only one feeling this way. The next day, I completely forgot about the surgery. I got out of bed and went about my day, full speed ahead with an eleven month old and a five year old. Back then, there wasn’t time to think or dwell on anything. By evening, I had somehow tucked both girls into bed by 9 pm without the usual silly hassle of multiple drinks of water and last minute requests. Already, divine intervention was at work. Quietly, I shut their bedroom door and tiptoed to the kitchen. This is what I used to call “mommy time.” The house was quiet, and I had a few moments of peace all to myself. As I entered the kitchen, I found myself in a strange place. It was as if a projector screen was pulled down in front of me. My eyes were wide open as I stood and observed the scene. I was standing at the head of a hospital bed. The white, soft curls were immediately recognizable. It was my grandma. Then it hit me. The surgery was scheduled for 9 pm! What is this warm feeling? How can she see me? I live in Minnesota. She lives in North Dakota. The answer swiftly popped into my head. I then saw a scene from when I was nine years old. My grandma and I were walking in her backyard looking at trees, flowers and birds. Our talk turned to how life soon is over and becomes death. “Chrissy, I am going to come back and haunt you.” She made these big scary eyes and starting hooting like an owl which made me laugh. As we continued on our walk we spoke of God and the afterlife. “Will you say goodbye to me before you leave?” I asked innocently. And, it happened. My grandma Hazel, who made me feel so important as a child, came and said farewell before going on to a much better place. Without warning, I was back in the living room and the warmth had disappeared. I cried because I knew she was gone. Shortly after, the phone rang. A family member said he had news for me. “Grandma is gone,” I said. That night, before bed, a poem came to mind. I can’t help think that she sent it my way. After all, she was a talented writer who never found fame or glory in it, but wrote for the love of it. Seventeen years ago today on January 29, 1998 I experienced my grandma’s goodbye. She held up green and red papers that were folded neatly. This news brought on an uproar so she quickly ran her fingers across the keyboard to begin the song again. After another rousing chorus, and peace had been established, she assembled us into a line to hand out invitations to the first school party of our young lives. I was thrilled to have reached such a pinnacle. Being the youngest of six, I had observed my older siblings celebrating events to which I was not privileged to attend. The instructions were that each child was to bring a boy/girl gift and in doing so, we would receive a gift in return. Over the weeks leading up to Christmas, our classroom became a blizzard of handmade construction paper snowflakes, endless Santa coloring sheets and a tree adorned with red and green paper chain garland. Each day, more presents appeared as the kids began bringing in their offerings. My mom bought a card game that was suitable for a child in that age group. She and I wrapped the gift and affixed a tag that was addressed to a girl from me. I was so excited to contribute to the pile under the tree. Many of us often looked across the room at the various sized boxes and pretty bows wondering which would make its way into our little hands. The day before the party, I came home to the delightful smell of spritz cookies and a tray that my mom was putting together for me to take to school. The days of waiting were almost over, and I could hardly sprinkle the colored sugar on the cookies in the right direction as my exhilaration grew. I woke up in the middle of the night fully aware that something was not right. My stomach felt like a washing machine that was stuck in the spin cycle. Chills ran up and down my skin, yet, I felt heat coming off my forehead. “Mom?” I called out weakly. Being a nurse, she was at my bedside in seconds with a basin. I guess by the time you have six kids you recognize a distress call even when you are in a dead sleep. It was a good thing she brought the bucket. I reluctantly fell back to sleep with tears brimming in my eyes at the thought of missing out on something I had waited my entire life for. I slipped into the black abyss of stomach flu dreams. By morning, I was not any better so I resigned myself to the fact that I was not going anywhere. “I will have your sister walk up to the school later this afternoon and get your gift,” she said trying to console me. I sipped on clear carbonated beverages and took small bites of saltine crackers as the virus worked its way through my body. Falling asleep off and on during the day only made time seem to go slower. I would wake up after a five minute nap feeling as if hours had gone by only to see the clock not advancing. Finally, I heard my sister return and voices talking in the kitchen. I propped myself up in bed. This was the moment I had been waiting for. My mom came into my room with a package that looked similar to the one I had brought. I looked up at her and saw a tinge of sadness. I unwrapped it and put it aside. The game that was supposed to bring so much merriment to another child now represented disappointment, and I would have rather thrown it into the trash. Years later, I found the deck on a shelf in my parent’s basement unopened. I opened the box and took off the shrink wrap and read the instructions. I realized that I had let someone ruin something for me so long ago. As a child, that is understandable. I had felt rejected, unwanted, unworthy. All these things that I felt in my heart that I could not express at the age of five. I had decided that I would take it out on the gift that had an intent to bring happiness to the receiver. As I played the game, I forgave this particular authority figure. Had she done the right thing? No. However, what was the point of hanging on to the pain? The only thing it accomplished was to keep me chained to my past. The moment had come and gone for her, I am sure. She probably isn’t alive today. So, the only person I was punishing was me. It is a well known fact that holidays with family and co-workers can be miserable for some. There can be awkward silences, or suffering in silence and then later rampaging and venting about how we can’t stand Aunt Gertrude or that demanding guy who has an office next to ours. The reality is, we can make this time of the year be what we want it to be. We have a choice about how we react to situations and how we feel. I am not suggesting that you ignore your emotions. Just don’t allow them to overtake you and find yourself in a drama of grand proportions. Don’t allow your joy to be stolen by a dysfunctional problematic Grinch. Eat. Drink. Be Merry. Pray. Forgive. Ask for forgiveness..because you are somebody’s Aunt Gertrude…and let the season be light. As you forgive, you are forgiven. All of this adds up to playing your cards right. I flopped into my bed at sunrise after a night of Black Friday shopping. I shivered under the covers as a slight hypothermia had started to set in. In a drowsy state waiting for sleep to fully descend, a picture began to form in my thoughts of my youngest daughter carrying a puppy in her arms. In my mind, I saw her go into her bedroom and shut the door. Then, another scene took its place of my other daughter carrying a puppy into her room and closing a door. After a few moments of consideration, I began to come up with every reason why I would NOT want this at all! I just had gone through a horrible divorce. I had never raised two dogs at one time. Neither girl was asking for a dog for Christmas. “I need them to be free. I cannot afford to buy dogs right now.” I knew if I threw that on it, it would not come about. I turned over satisfied that I had dismissed the entire emotional episode and fell into the most peaceful sleep during the daytime with the sun fully shining. A week later, I received a phone call. I had not spoken of my experience, and I had forgotten about it. “How much does she want for them?” I asked. My ability to hear correctly shut down because the event from the week before was hitting me full on. After I made that statement, I felt a heaviness and slight sadness in my heart. So much so that I had to blurt out the whole story about each girl getting a puppy for Christmas. “I guess I will,” I said. I told him to give my phone number to the puppy owner so she could call me later in the day. She did so, and I made the mistake of putting the call on speaker phone. I had each girl hanging on my every word as we spoke. My oldest daughter wanted a boy, and the other wanted a female. Taking only one was no longer an option. I made arrangements to go see the entire litter later that day. While driving over for our visit, I began to feel myself panic. I silently went over all my reasons why I should not have been engaging in this. Once I saw the puppies, I knew I wasn’t going to be able to say no. As I fretted along, I felt a strong peace settle in my chest. It was like my mind was whirling a hundred miles an hour, but I had a calm that kept my foot on the gas and the car moving toward the destination. When we arrived and I knocked on the door, I heard a chorus of barking. The three of us were greeted by puppies running around us in circles. We decided to sit down in the middle of it all to see what would happen. A small little male came and settled in quite nicely on my oldest daughter’s lap. A smaller female came to occupy the other daughter’s lap. “Ever since we got off the phone, these two have been sitting by the door like they were waiting for you to come,” Ellie, the owner, said. The decision had made itself. Lily and Stinky were now ours to keep. We left them in her care for another week and on December 12 they came to take up permanent residence in my home. Both girls had been given free dogs for Christmas. I still don’t fully understand how they came to be mine because having two dogs was the farthest thing from any of my wishes. However, they completely changed the entire atmosphere of my home. We all laughed more often, and I worried less. Many times, we would entertain ourselves watching the two of them tussle over toys. I can still see Lily, all of two pounds at the time, dragging her brother Stinky across the living room floor by the toy in his mouth. He had clamped onto her favorite stuffed animal and wouldn’t let it go. They became a good distraction from all that had gone wrong. Oddly, after we had gotten them, my youngest daughter told me something even more strange. After our black lab was adopted, she created a virtual dog on one of her gaming systems. It helped her to get over the fact that our real dog was no longer with us. She named her virtual pet ‘Lily’ and gave her a black coat just exactly like the real Lily. The dogs were already named when we went to go visit them, and we kept their names once we got them home. All of it seemed to be so arranged. In a very good way. The following year, as Christmas was approaching, I made up cookie trays and wondered if Ellie would like one. On the night before Christmas Eve, I had a strong inclination to put together a tray and get it to her house. Snow was falling hard that night, but I knew I was to deliver this to her. When I knocked on the door, I heard the familiar sound of barks. I saw the tears come into her eyes, and then she hugged me while I tried not to drop the entire tray. That is how I felt about her gift of the dogs to me. They came at just the right moment in my life, and I didn’t even realize then how much I needed them. Someone who loves me deeply knew and sent them my way. Just more proof that we are loved completely from head to tail. The Sunday paper was lying in a heap on the kitchen table. As usual, it was Monday, and I was finally getting around to reading a few of the ads. Most of the inserts spoke of doorbuster sales, but I wasn’t thinking of finding Christmas gifts early. Instead, I needed two turkeys for Thanksgiving. As I paged through the various catalogs of information, I wondered what had happened to this holiday? It seemed like we no sooner had Halloween and all its uproar with candy scarfing then we hurtled full speed ahead to boughs of holly and mad dashes to find the perfect gift. What had happened to the cranberries, the stuffing, the giving thanks and a day of digesting one of the best meals of the year? I located the grocery store ad in hopes of finding a buy one get one on frozen turkeys. In years past, this had been offered, but it became apparent that our economy had taken a hit as I could not find a deal on any turkey. I thought maybe the week before Thanksgiving this would surely be an offering. No such luck. The reason for buying two birds was not so I could eat them both, but my intention was to give one to a good friend of mine who had just gone through a divorce just like I had. He was going to be cooking a meal for his kids for the first time as a single man. I guess I was trying to take away some of the stress by helping him along in the kitchen by giving him the main dish to which he could easily add in the sides. I was not at the height of having an abundance of money, but I knew I was to help him out this way. I put the paper aside, and I made the decision that I would go out and buy each of us a turkey the next day. In the meantime, I had to take my youngest daughter to her dance class. While driving, I mulled over the predicament. I knew exactly to the penny what I had in my checking account and back in those days, a savings account didn’t exist. I was never one for using a credit card to buy my food, so I knew I was going to have to just fight off the fear of lack and do it anyway. After I dropped her off at her class, I sat in my car and said a quick prayer asking for help in apprehending two turkeys for our meals. It wasn’t anything fancy. Just a quick shout out to heaven with a simple thank you. Then, I put it out of my mind and got out a book to read while I waited. Your name has been submitted to receive a free Thanksgiving basket. Please come to the address listed below on Wednesday to pick up your items. Thank you. I could not believe it! Just moments ago I was worrying over how I was going to give away a turkey that I didn’t have to pay for and now I was going to be able to give away an entire meal! Not even for a moment did I consider keeping this gift for myself. I wanted to give it away to a person who was going through a hard time of adjusting to a new way of living. I was so overjoyed that I barely heard the phone ringing when I came back into the house. It was one of those moments when my mouth hung open on its own accord, and I lost my ability to speak for a few seconds. “Sure. I would love one,” I said. I assured her that I would. On Wednesday, I stood in my kitchen with two overflowing baskets both containing two large turkeys, stuffing mix, cranberries, canned vegetables, fresh potatoes and all the staples every well stocked pantry could afford such as flour, sugar, butter and even a gallon of milk! As we approach this time of the year once again, I am reminded of how I had no need to worry about any of the details. I had asked for help, and the divine had come to my rescue. Even before I had prayed, heaven had made a way for turkey for two. “Oh no. Oh no. Oh no,” while trying to reach down to stop the madness of the river forming around the feet. The dilemma really was to try and get out of the blue puddle and race my fast melting purchase a few steps into the outside freezer without tracking detergent all over. At the same time, I was very aware of the sticky feeling that was beginning to happen between my toes. The ice took precedence as I skipped unhappily over to the refrigeratior to solve problem number one. When I returned to the scene of the mess, my daughter came outside to help carry in more groceries. Because the liquid was right behind the trunk of my car, she had to keep her feet way back, reach in to grab more groceries and edge her way out without touching the glob. While she did this, I carefully picked up the container to attempt to clean it off and get it to the laundry room. 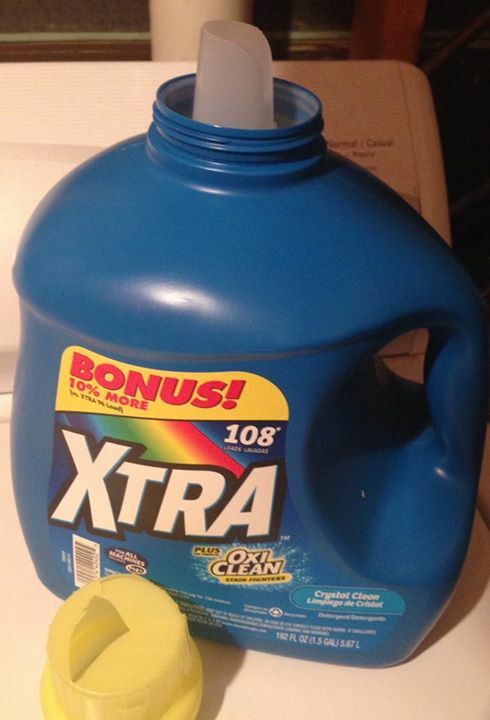 “I purposely picked out the bigger one with Oxiclean it. Now it’s all over the floor!” I said as I whisked into the house irritated at the circumstances. “Trouble. Trouble Trouble.” Followed by a bit of running over ahead and then the sound of the faucet running. It turned out, she had her run in with the soap as well. As she was trying to get more groceries out of the back, a large wrapped loaf of Italian bread took a dive into the puddle. I found the bread in the sink. My hands and entire body reeked of detergent. With the skills of a kitchen Ninja I carefully extracted the bread from the bag with the tongs without touching the afflicted bag. And, then it hit me. Laughter. I was laughing so hard thinking about the two of us nearly running into each other in the garage and walking with my feet spread wide apart as if that would help anything. And it doesn’t. It never does, but I do it anyway to make myself feel better in those types of situations. This then led me to recalling another time of chaos. “Mom, I don’t feel good,” she had said just before bed. “I have a headache and my stomach feels weird.” I was exahusted from a full day of chores around the house, and I wanted to get to bed. “Why don’t you sleep on my floor?” I made up a bed for her with pillows, extra bedding and a basin in case of an emergency. Within moments of being in the kitchen, I heard my bedroom door open. I knew instinctively that something was amiss. Our black lab, Shady, thought my daughter was coming out to play. While I attempted to get to my daughter, the dog lept in my way. Dog and daughter collided in the hallway and suddenly there was vomit all over the back end of that dog! My daughter scampered into the bathroom while the dog ran crazily into my other daughter’s bedroom, jumped on her BRAND NEW comforter and began rolling around on it. I stood in the hallway not knowing which way to go first. Do I get the dog off of my upset teenager’s bed, or do I go rescue the one in the bathroom? The next step was to get the dog calmed down which wasn’t easy. Once in insane play mode at over 80 pounds, she was difficult to harness. I finally grabbed her by the collar and dragged her into the tub. She abhored baths and thought of them as punishment, so to make her feel better, I got in with her and turned on the water. She sat down looking defeated and dumbstruck. How had playtime turned into bath time? As I began scrubbing her down, I began to laugh so hard I was crying. Her face looked so dejected. It had been months since I had really had a genuine good laugh. I had just come through a horrible divorce where grief and pain greeted me each day as a reminder that my life seemed like a failure. There was no room for joy as I went through the motions of trying to get to everyone and everything. The more I laughed, the more depressed the dog looked which made me laugh more. Once the dog was dry and escaped the bathroom happily, the ill child was sleeping peacefully, and I had loaded the dirty bedding into the washer, I felt relaxed. It was nearly 2 am before I got to bed, but I went to sleep that night feeling that some of the sadness had departed from my spirit. I was on my way to healing. I believe it is in the moments of what we would call ‘insanity’ that many of us come to realize we need to find our sense of humor. If we don’t find it, it may just come calling for us. Joy snaps us out of a place of despair and connects us again to the One who wants to see us happy. Warm sun and fresh air!